All transactions are safe and secure with a reliable history in online purchasing behind each of our associates. Buy the One Eyed Willie's Captain's Wheel t-shirt to own Goonies clothing and merchandise. Goonies are always welcome on board when One Eyed Willie is at the helm. This imaginative tee displays One Eyed Willie's skull adorned with an eye patch and positioned at the center of his captain's wheel. The movie's title can be seen above the wheel. Underneath the design is the Goonies quote, "Never say die." This design is an inspiring ode to the 17th century pirate who helped save the Goon Docks. 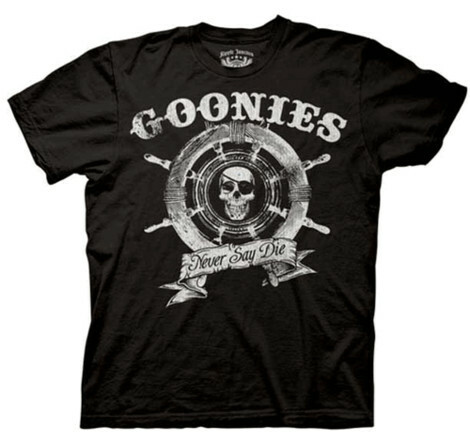 Wear this Goonies t-shirt when you're in the mood for a high seas pirate adventure. In addition to the One Eyed Willie's Captain's Wheel tee above, browse the Goonies Clothing Gallery for more apparel like men's and women's clothes, kids shirts or hoodies.